Topps has been searching for ways to connect their digital card platform with traditional physical baseball cards. 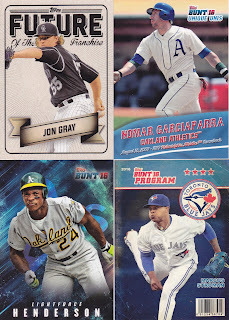 Their quest for a solution has arrived in the form of 2016 Topps Bunt. The 200-card set is the perfect format to get multiple generations excited about baseball card collecting, no matter the platform. Imagine a young child and their parents sharing the joy of opening a pack of baseball cards and both teaching each other about the nuances of preserving baseball cards while building a collection that lives at your fingertips on your phone. Even the players included in the set warrant a bonding experience, as the likes of Mike Trout, Bryce Harper, and Andrew McCutchen, are right alongside Cal Ripken Jr., Ted Williams, and Willie Mays. While the younger collectors will gush about the accomplishments of their current heroes, the inclusion of the sport’s legends allows for the conversation about the history of the game to continue. The box provided for this review yielded 36 packs, allowing for a complete 200-card set to be collated with the purchase of one box. A variety of inserts in 2016 Topps Bunt trump the designs of those included with the Opening Day series earlier this year and rival those in the Topps flagship set. The digital component comes in the form of Bunt Loot Packs, which are ten-card redemptions via the Topps Bunt App. Collectors have the opportunity to unlock a bevy of inserts that run in a similar limited fashion as to what one would find in a physical box. Topps has been integral for the past 65 years in preserving the game through iconic cardboard images, and continues to do so with 2016 Topps Bunt. With a price point of under $30 a box, 2016 Topps Bunt is a fun and inexpensive way to share the joys of collecting and the narrative of the National Pastime no matter whether it is analog or digital.